Volkswagen has already improved the near-perfect family car with the introduction of the seventh-generation Golf, so it should come as no surprise that it has been swiftly followed by a more practical Estate version. With the same broad choice of engines and trim plus the promise of high quality it could be the compact load carrier of choice. The Golf has been Volkswagen's core car for decades and has always set the tone for the rest of the range. It has offered a continual improvement in perceived and actual quality, as well as significant strides in fuel economy and safety over the years. Couple that with the taut, understated design that has been a hallmark of the model and its huge success is no surprise. Another key reason why the Golf has succeeded is the amount of choice across the range. It has one of the largest engine ranges in the sector, and although the trim offerings are relatively straightforward there are a multitude of options and options packs to suit all needs. The choice extends to the bodystyles also. Alongside the three and five door hatchbacks now comes the estate model, a vital offering for families and those needing a little extra space. A small increase in length over the hatchback gives the large boot area and near-vertical tailgate without harming interior space for passengers. The exterior changes are blended seamlessly into the existing Golf shape, and it remains a tidily-styled and attractive car. In fact this latest Golf Estate is closer to the 'lifestyle' type rather than a traditional wagon, in appearance at least. The Estate gets most of the ultra frugal line-up of engines, including the impressive TSI unit. Available in two different outputs it maximises fuel efficiency, squeezing extremely impressive performance and economy from a small unit. More traditional are the 1.6-litre petrol and 2.0-litre diesel units - again both finely tuned to provide economy without sacrificing performance. If a standard Golf hatchback just isn't big enough for you then you won't be disappointed by havingto choose the Estate. It's certainly the most attractive estate version of the Golf to date and demands no compromises in terms of the driving experience while offering a well-sized load area.Some might be tempted by more space for less money or even a full premium-price lifestyle wagon witha price to match, but the Golf Estate strikes a happy balance between the two. With impressive economy from the entire range of engines the Golf represents a cost effective car to run. Insurance groupings are low thanks to good security and safety measures. The arrival of the BlueMotion version will see potential savings increase further, too. Although very reasonably priced in standard form, adding some of the impressive but expensive options can soon see asking prices escalate. The Golf Estate has a useful extra dose of practicality over the regular Golf, with good levels of head, leg and elbowroom for front and rear passengers. There are also useful storage areas throughout the cabin, and thoughtful touches like a bottle opener and lined coin tray add to the convenience.The boot itself is large and well shaped, with lashing eyes to secure large loads. The Golf is very obviously a Volkswagen group product, and the new interior bears all the traditional hallmarks. That said, the dials have been repositioned and made clearer with permanent white backlighting and other improvements include the relocation of the steering wheel adjustment lever and electric window switches - tilted towards the occupants and made easier to reach. Central controls are neatly packaged, with a minimalist approach that works well. Once again an excellent level of comfort comes as standard with the Golf. Refinement is better than ever, with excellent insulation from wind and road noise as well as quiet engines. The seats are supportive too even over long journeys. An immobiliser is standard equipment, as is an automatic speed sensitive door locking system that can be deactivated if required. Naturally, all models feature remote central locking and the lockable glovebox is an additional benefit. The load area can also be shielded from view with the useful cover. A five-star safety rating comes as no surprise considering the impressive array of standard passive and active safety systems incorporated into the new Golf. A raft of airbags including one for the driver's knee, a whiplash restraint system and seatbelt fastening detection for the rear seats are all included. ABS with brake assist, an advanced ESP system with a differential lock and traction control and automatic hazard light activation are all important elements to avoid an accident in the first place. There's virtually nothing to distinguish the Golf Estate from its excellent hatchback sibling; the same very high levels of grip, balance and control are in evidence. All the controls are beautifully weighted and make it a pleasure to drive whatever your mood. Although the diesels will likely prove most popular the sprightly 1.4-litre TSI unit is both frugal and fun. 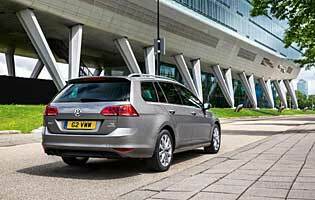 An excellent family vehicle, the Golf Estate is prepared for pretty much any eventuality. Spacious, practical, safe and easy to drive it's the ideal choice for families of five or fewer. The Golf would be an extremely good choice for a first car if it wasn't for the excellent range of even smaller vehicles in the Volkswagen stable. 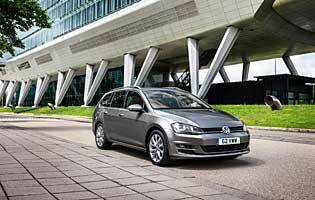 However, if a larger vehicle is required, the Golf's easy nature makes it a sensible choice. The Golf has one of the finest reputations in the family hatchback market, built on successful previous generations that have shared the same strengths. Quality has taken another big stride forward with refinement and road manners improved still further. The Golf's popularity means drivers won't particularly stand out from the crowd, but the Golf badge still has cache. Nothing less than easy access through all the doors and to the boot would do. Generous doors front and rear present no problems, while the tailgate gives a good opening for easy loading. An electric tailgate is available as an option too. There's a wide choice of bright and more subdued colours available for the Golf Estate and unlike many cars it wears both options very well. On the inside the default dark colours can leave the cabin feeling a little sombre, but there are brighter options. 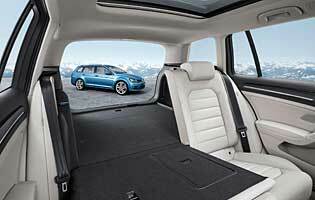 With a more steeply-raked tailgate compared to the hatch it is much easier to judge the extremities of the Golf Estate, making it easier to put into a parking space. Unfortunately parking sensors are an option on all but the top GT model, while the automatic parking system is not cheap but works exceptionally well. Steel space saver fitted as standard. Petrol engine options - 1.2-litre (84bhp, 104bhp); 1.4-litre (120bhp); 1.4-litre ACT (138bhp). Diesel engine options - 1.6-litre (104bhp); 2.0-litre (148bhp, 168bhp). Transmission options: six-speed manual gearbox, seven-speed DSG twin clutch automatic gearbox with switchable sequential manual mode. Trim levels: S, SE, GT.